Lately, I’ve been wondering. Ok, in the last seven days, I’ve been wondering if things happen for a reason, or simply by accident. Yes, I am specifically talking about my little accident. But more to the point, I’m curious to know IF I broke my right arm completely by chance, or because there is something else at work. Did ‘Fate’ play a hand in me being where I was, at that particular time, when it was raining, when the pathway was wet and slippery, when my shoes didn’t / couldn’t grip the surface sufficiently, when my other hand was full and unable to assist with breaking my fall? Did I foresee ‘something’ was going to happen? Did I have a premonition? I think maybe I did. I was only recently I’ve thought a lot about teaching myself to write with my left hand. I even went so far as to buy a book I could use to practice writing in. Now I know there isn’t a need for a special book to use, but I was curious and wanted to keep all my efforts in one place so I could look back and assess my progress. But I hadn’t started, and the book remained unused. As I see it, the Universe delivered a broken right arm and no excuse to put it off any longer. And therefore, while I’m (slightly) incapacitated, I am determined to learn to write with my left hand. So far, I think I’m progressing nicely. Each day, I open my book and write the date at the top of the page. I then proceed to write the alphabet in lowercase and uppercase. 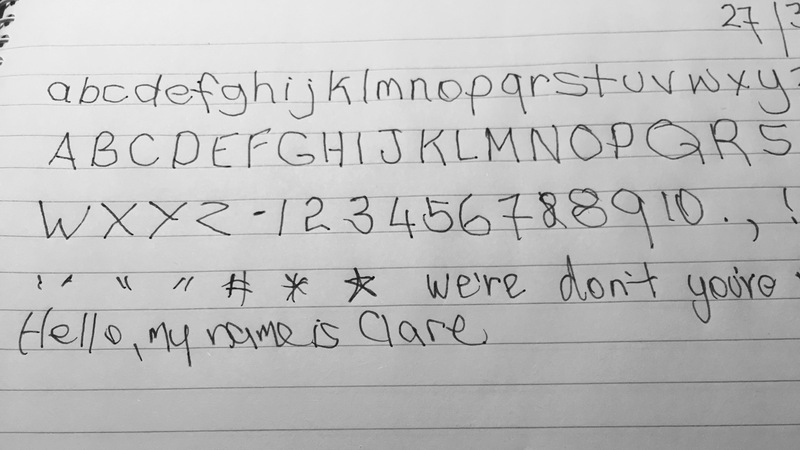 I write my numbers and have started to include some punctuation marks, a few symbols, and yesterday tried to write ‘we’re, don’t, you’re’ and the big one – ‘Hello, my name is Clare’. Circles and curves are giving me a bit of trouble, but I’m sure I’ll get there with them. At least I can now write the entire alphabet on one line – in lowercase anyway. I can’t sign my name yet, but I can write it legibly and did so three times yesterday. Woohoo! I deserve some sort of medal for those efforts considering other people could read – and comprehend – what I’d written. Like I’m the first person in history to ever do so. Anyway, I do wonder if purchasing that book was a prelude to a broken arm, that I had a strong feeling something was about to happen. Or that everything simply the result of random actions and reactions. Previous Post Previous post:What’s Holding Me Back? Your left-hand work is far more legible than my note-taking. There are times I scratch my head, looking at my notes, wondering what the heck I had scribbled. Then, it’s to the phone, to double-check. Congrats on your left-handed ability! I’ve asked myself that question many times. Like when I ordered my cup from Zazzle last year with the words Embrace Imperfection on it. The minute I opened the package that sucker slipped out of my hands and a big hunk broke off when it hit the floor. It’s now on my desk with pens in it, and I ended up ordering another one that said, EMBRACE IMPERFECTONS! This is ALWAYS a great question! Oh dear. Isn’t it always the way? Your sinister writing is devilishly good, Ms Clare. I just noticed I dated my work 27/3/18 – ha, ha! Must be the painkillers addling my brain. WOW! You are a lefty! Fate is fickle at times, love your take on the prompt. I don’t know if it was fate, but I just want to say your left-handed writing is excellent for a right-hander.